Chester with his Christmas toys! 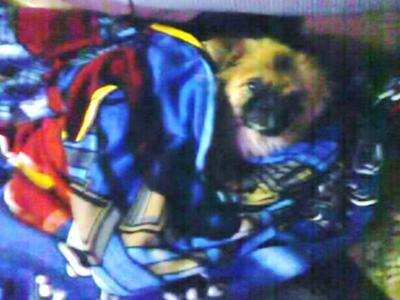 Chester in a superman blankie – First trip to Philly! So, here is how it went. My mother got a root canal and the dentist drilled up into her nasal cavity and now she has bone chips in there. She was feeling horrible that day & just wanted to get out of the house. She took me to the humane society knowing that ALL I wanted was a small dog breed for Christmas, a good apartment dog, and she knew I'd be happy with one. Even if it was a mix. I love animals, and I am a training Vet Assistant at a Vocational School in PA. Here, at the very minute my mother and i pulled up to the humane society, some HUGE guy was dropping off his neglected Tibbie (Tibetan Spaniel). I only say he was neglected because he had a horrible skin infection, mats behind his ears, but other than that, he was in perfect health. The man said he "found" the dog, but i knew it was his. He called it Chester. The dog followed him around like they were best buds, and he even jumped into the mans car without being told to. I know i went out on a limb just taking this man's word on this beautiful dog. But, i'm glad i did. We got the most loving, affectionate dog that we have ever owned - FOR FREE! Chester has some odd problems, like climaxing on the cat, separation anxiety from me, and the two cutest things ever, when we leave him at the house, whether its for 10 minutes or an hour, he will drag our dirty clothes everywhere and just lay with them because they smell like us. Then, when we take him for his walks (more than once a day, so you think he'd be used to it) he tugs his leash and takes YOU for the walk. I know i can't tell him no for those two things because he's just showing affection in a sometimes messy, weird way. Chester loves to cuddle, especially in bed, on the couch, or under the coffee table. He calms the guinea pigs down when they are yelling. It's so adorable! He also likes to play peek-a-boo & he loves when i kiss his cheeks, he's basically French! He'll turn his head when i kiss one side so i must kiss the other! 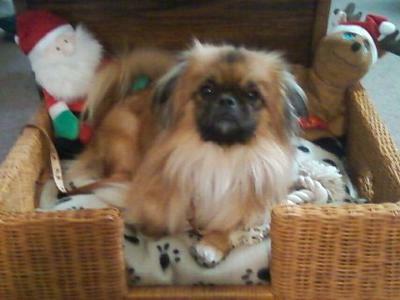 Comments for Tibetan Spaniel - All I Ever Asked For! 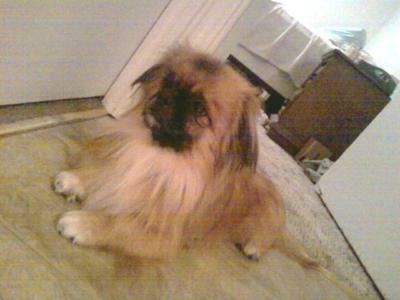 I have a tibetan spaniel too and she is exactly as you described. She has so much love in her. She cannot get enough kisses and belly rubs! I am sad whenever i leave her home. But once i get home she jumps in my arms and gets so excited and kisses me everywhere. I am happy when she is happy. the perfect companion. I spoil her to pieces too.